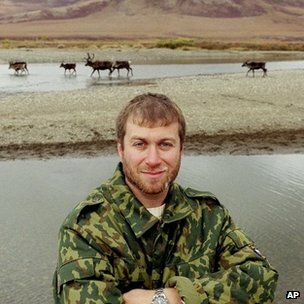 Abramovich’s Chelsea is ten (Part Two): A Brief Insight of the Russian Billionaire. Roman Abramovich celebrates his ten-year anniversary as Chelsea FC owner today. The secretive Russian billionaire was reported to have a personal fortune of £3.5bn when he took over from Ken Bates in 2003. In 2004, Sunday Times said he was worth £7.5bn, putting him at the top of Britain’s rich list. The 2013 Sunday Times ‘rich list’ places him fifth in the UK worth £9.3bn. Here are some few more facts you might not have known about the Russian who dropped out of a Moscow college before making his fortune in oil deals in the early 1990s. Abramovich lost both parents at the age of four and was later adopted by his uncle. He gained a law degree from Moscow State Law Academy in less than a year. Notoriously media shy, Russian TV did not have a photograph of Abramovich until 1999. He owns the biggest yacht in the world, the Eclipse. The 340m vessel has two swimming pools and a submarine. Abramovich spent over £5m on a party at St Bart’s Hospital where the Red Hot Chili Peppers performed. He bought nine apartments in London and converted them into a 30,000-squaure foot apartment, making it the most expensive property in London. In 2008 he spent over £60m on two paintings in a two-day spending spree at Christie’s and Sotheby’s in New York, buying Lucian Freud’s Benefits Supervisor Sleeping for £17m and then Francis Bacon’s Triptych (1976) for £43m. Rangers Arrives Sfax For An All- Important Confederation Cup Clash Against Sfaxien. Cristiano Ronaldo is Wary of Excessive Pressure on Gareth Bale. Crown FC Sees Fault in the Officiating of Their Federation Cup Match with Lobi. Previous articleTennis: Robson Loses Out To Kanepi.